​Jake Fitz was stickbaiting the Muiron Islands with some jackson kaikens this week and managed to get some good spangoes and a 57cm trout that came to the surface for a great visual strike. The spangled emperor were competing with others which also made for great visual attacks on the lure in the crystal clear waters. Bunbury fisherman Jamie Campbell and friends came up for a few days when the forecast looked good. The crew hit the water depths between 70-110m using squid baits to target reef species. They managed to catch a great mix of red emperor, saddle tail, goldband job fish and even scored a coral trout from the deep. Young angler Daniel Charsley who turns 17 this week went out with his Dad last weekend to target billfish. The youngster blitzed it on the day landing a black marlin, a blue marlin and a sailfish; getting a grandslam on billfish. Far out, most avid adult anglers (including myself) have never done this. To have this angler and another grand slam recently by small fry angler (aged 7) Zac Owens is amazing and shows how great the fishing can be here off Exmouth in awesome grounds that are so close to shore. 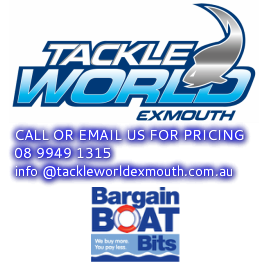 In fact, it also shows people one of the main reasons that the Exmouth Game Fishing Club hosts the annual Australian Junior Billfish Tournament (AJBT). This year it will be held from Sept 29-Oct 1st with local teams and anglers travelling from afar. Junior angler Jet Worsteling will be here with his mum and dad from Melbourne to compete during their annual holiday after the Perth boat show. We also are hoping to have some oversead anglers come for this event. Tara Golding came to Exmouth from Port Hedland and went out with her sister Rowena to target billfish and caught her first black marlin. Another keen female angler has been in Exmouth for days on charter targeting billfish on fly. We also had the Ladies Day tournament on the weekend with Raquel Roche and Anna Passmore catching their first striped marlin. Their team on Azura took out the tag section and Champion Boat Overall, while Kajiki won heaviest mahi mahi and In Deep won heaviest tuna. Team Balls Deep got a sailfish and the weather was insanely good with light winds and calm seas. There has been loads of squid about near Learmonth this week and plenty of anglers reporting good catches. Smaller jigs seem to be the hot favourite, and where there is one, there is usually a lot more, so be patient and persistent until you come across a good patch. The weed areas are usually best for squid, although you can have them in other areas as well. The crabs in the gulf slowed down last week, but hopefully they will pick up again in the coming weeks. 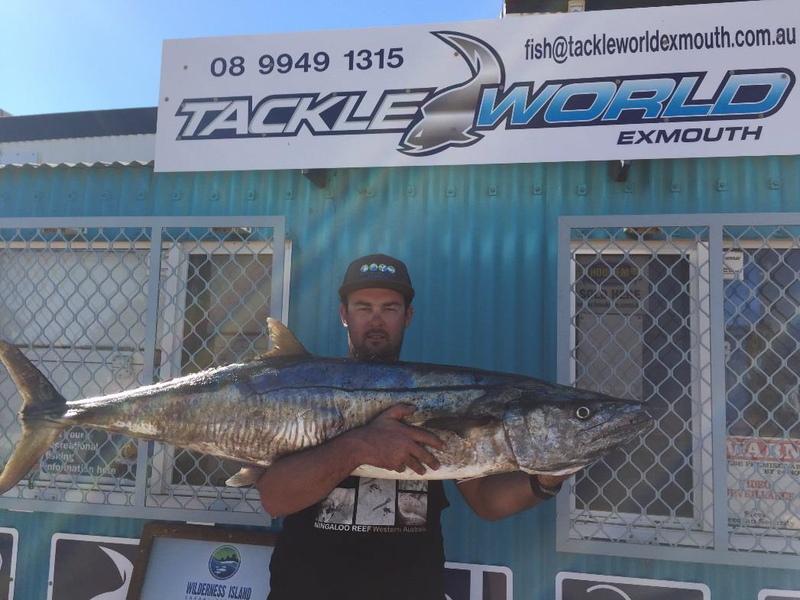 ​Paul Mather and his brother Greg come to Exmouth annually for a two week fishing holiday and this year the two have got in to some great action on the soft plastics in the gulf. The golden trevally have been falling to the lures and the weather has been awesome for a few trips out. The windy days have had the guys chasing the muddies and shoreline for other species and that has not dissapointed either with some honker crabs found in the mud. The boys have entered in the fishing comp and are keen to return again next year. Squid has been the ultimate treat this week with one guy thinking he had a ray on, but instead it was a massive squid. There has been schools of squid inside and outside the reef on the west side. Last year around the same time, local operator Captain Josh Bruynzeel was catching fish feeding on schools of bait westside that were spewing up copius amounts of squid. It’s so awesome to see such a healthy fishery here. There have also been rather large schools of bait in the gulf, which is a bit early for the year, as we usually expect them in September. These schools are attracting predatory species and the sailfish might just come earlier this year. One local boat just headed north for a week and in one day they managed to get 9 sailfish and 2 blue marlin in one day! Other vessels returning from fishing areas north of the Muiron islands have reported lots of sailfish and small black marlin in the shallow waters around 10-30m where mackerel usually haunt. The marina has been doing particularly well for bream this last week with the colder temperatures and strong winds forcing people to look at other options. Juvenile GT’s can also be found cruising through this area, along with the odd queenfish and even dolphins venture in for a look. Cod have made their homes in certain areas in the canals and it is another great option for fishing that is close to town. Throughout the year we get families travelling around Australia that stop in here for a week or two. This week there was a family from Tasmania, the Hanlon’s, who are so hooked on the area for the fishing, snorkelling and diving that they are seriously looking at options for staying long term. Of course, the locals are complaining of the cold, but this family believe it is hot with the kids swimming daily while fishing from the shore. They have had success with spangled emperor using baits of squid from the shore, particularly on the incoming tide after the turn of the low. We recommend using as light a rig as possible to allow the bait to slowly sink down to where the fish are roaming, rather than a heavy weighted rig that takes it straight to the ocean floor. The larger fish seem to patrol the mid to high water, while the small fish seem to hang close to the bottom. ​Rohan Sankey is up on holidays and came in to the shop for some local information on what is biting, where. 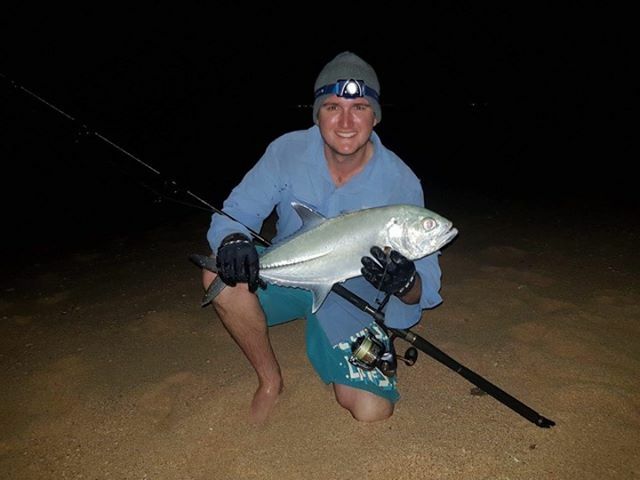 The staff suggested he go to certain areas for the wind and tides and put him on the right spots, so he managed to catch giant trevally and big eye trevally at oysters and a queenie near the tip of the cape. The new moon phase at this time of year is the best time to walk these areas at dusk and after dark, but we thoroughly recommend having a headlamp and good rock spike boots, not to mention a backpack and warm clothing. Gloves is another essential, especially if handling fish for release. It is best to have someone with you in this area at this time, as sometimes the swell can pick up. We also recommend using barbless hooks for ease of hook retrieval. Winter resident Trevor Earl managed to get himself an 8.5kg giant herring in the gulf last month, which was a very fine effort. However it was pipped at the post for the monthly competition by Kev Towers, who landed a cracking bluebone about the same weight. Giant herring can come in big numbers at this time of year in the gulf and they are often at the tip of the cape as well. The bluebone are good at anytime of year and are one of the tastiest fish in this area. Make sure if you get one to use the whole fish including the wings and head. The wings are sensational on any fish and can be baked or fried. The head of the bluebone makes the best seafood chowder in many peoples’ opinion and you can also baste the frames with soy and honey, then place on foil on the bbq. The amount of meat you can get from all these methods is amazing and should not be wasted. There is actually a group of people that have a specific ‘wing night’ every so often and invite people over to enjoy all the wings cooked up with each person bringing a salad, which is great to see. Sports personality Andrew ET Ettinghousen returned to Exmouth for another filming session this week. ET has filmed here at least four times previously and it’s great to have him back to enjoy the fishing on offer in Exmouth. Other TV personality Paul Worsteling will return soon with his family without the cameras for another fishing holiday. Paul fishes around the world, and it shows how great the fishing is here when he continuously chooses Exmouth for his family fishing holiday. Spring has sprung and the brilliant weather of late (touch wood!) has helped increase the water temperatures, not to mention allowed many crew to get out and in to the action in what is a magic time of year. The weather has been described as perfect by many locals and visitors with it not too hot, nor cold, not wet, not windy, with no flies, mozzies or sandflies about. Let’s hope it continues through to the school holidays for many others to enjoy. Jimmy Small and Sam Crock had a day out diving last week and got in to some decent coral trout, blueys, jobfish, chinaman fish and a thumper spanish mackerel that tipped the scales to a whopping 28kg. The fish was short and fat and made for some great butterfly cutlets on the bbq. Quite a few spearo enthusiasts have been heading out this last week with insane visability despite the large tides. The select method of spearfishing is gaining popularity and with so many camera options these days, you can see some amazing footage online. Bottom fish are on the chew with many anglers getting their daily bag limits. One boat did only half a day and got the limit on trout, rankin, gold band and large mouth nannygai, otherwise known as saddle tail snapper. Plus the same boat got 17 sailfish in just over 1 day of fishing! Another charter operator that usually prefers sport fishing, had some clients on board that only wanted to reef fish and had their limit by 10am! The sharks have not been as pesty with the reef fishing, but perhaps it is because they are so well fed at present with all the bait schools around? Have you got a boat? If you are taking friends out, make sure you remember to do a saftey brief with them prior to leaving and check all your gear onboard. The government departments do regular checks and it is a huge dampner to a day out if you get fined, or worse, if you get in to trouble and don’t have the correct safety gear for the situation. Fishing and boating is great fun, but please remember the safety. Squid, whiting, crabs and flathead have all been reported from the gulf side. If you are not sure where to go and what is biting, drop in store and ask. There are plenty of options around the Exmouth area and we always recommend people target something specifically to help focus on success.